As January dwindles and we turn into February each year, the spirits are lifted with the opportunity for spending time in beautiful surroundings to enjoy the splendour of the beloved snowdrop (Galanthus). Across the country gardens are woken with their magic carpet of blooms, a welcome sight and a seasonal pleasure. At Hodsock Priory, in Nottinghamshire, the Snowdrop gardens and woodland walk re-opens from Saturday 10th February until Sunday 4th March, 2018, when once again visitors will be able to enjoy the sight of millions of snowdrops covering some five acres of the estate. George Buchanan, (pictured left) manager and ninth generation resident of Hodsock Priory, welcomes visitors to the Estate and daily, by the campfire, he enlightens you with his History Talk, including secrets about the estate and his ancestors. 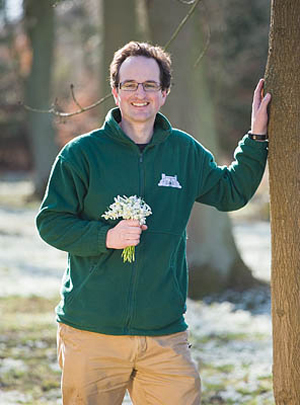 George is often asked by visitors about his favourite snowdrops: “It’s an obvious question for someone surrounded by around four million blooms each February,” he says. 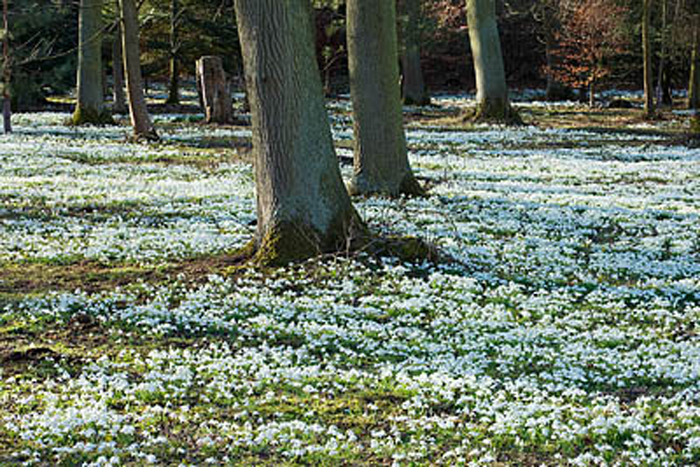 His answers might vary a little but always he finds he draws back to a top five: “Eagle eyed visitors can see 82 different types of Galanthus at the Hodsock Estate, including two varieties named after my relatives,” he points out. He remembers his grandma well and Galanthus ‘Barbara’s Double‘ was her snowdrop. She was an excellent gardener and it was thrilling for the Buchanan family to have this variety named after her. Keeping it in the family, the Galanthus ‘Lady Beatrix Stanley‘ (pictured right) was named after George’s great-grandmother who knew E. A. Bowles, the ‘Godfather of Snowdrops’. Galanthus elwesii ‘Grumpy‘ is an attractive single snowdrop despite a rather unflattering name. The inner markings look like two green eyes and a scowling mouth, so they’re full of character. Galanthus ‘Flore Pleno‘ grow in great drifts at Hodsock and really take your breath away. The double wild species snowdrop has a lovely scent and divides and spreads the most easily – a great help to us on the estate. Sarah Raven describes the flowers as being like the underskirts of a ballerina’s tutu! 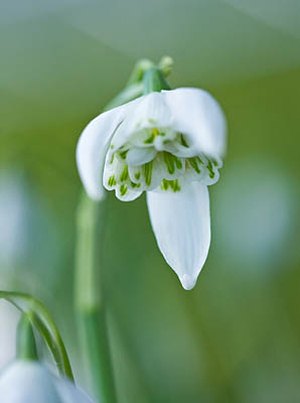 Lastly, a snowdrop whose chosen for its entertaining name. Much loved by George, the hybrid Galanthus ‘Tubby Merlin‘ is small in stature, a rare variety with a honey scent and totally green inner shell. Over the weekend of Friday 16th to Sunday 18th February, 2018 there will also be an added attraction at Hodsock Priory as they welcome an awe-inspiring aerial and acrobatic outdoor theatre. The Whispering Wood Folk will perform in Horsepasture Wood and in addition to the campfire and daily history talks, there will also be a Fire and Light show over the same weekend. Hodsock Priory is situated at Blyth, Worksop, Nottinghamshire and is easy to get to – just a few minutes drive from the A1M at Blyth. Picture credits: all pictures ©Hodsock Priory – Credit Clive Nichols Photography.